Tips – Starting with around 20,000, increases the chance of instant approval. After this approval, your limits will increase automatically with requirement. 8. Click on “Add another request” button. And, start adding Request 2. Tips – Starting with around 20 mails/ second, increases the chance of instant approval. After this approval, your sending rate limits will increase automatically with requirement. 12. 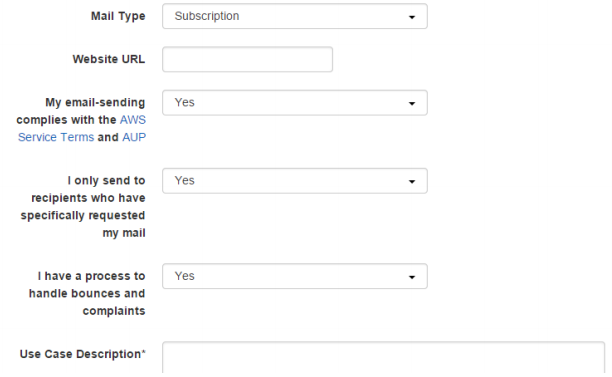 Select Mail Type as “Subscription”. 13. Under “Website URL”, put the link of your business website. 14. Read the AWS Service Terms and AUP and Select “My email-sending complies with the AWS Service Terms and AUP”, as “Yes”. 15. Select “I only send to recipients who have specifically requested my mail”, as “Yes”. 16. Select “I have a process to handle bounces and complaints”, as “Yes”. 17. 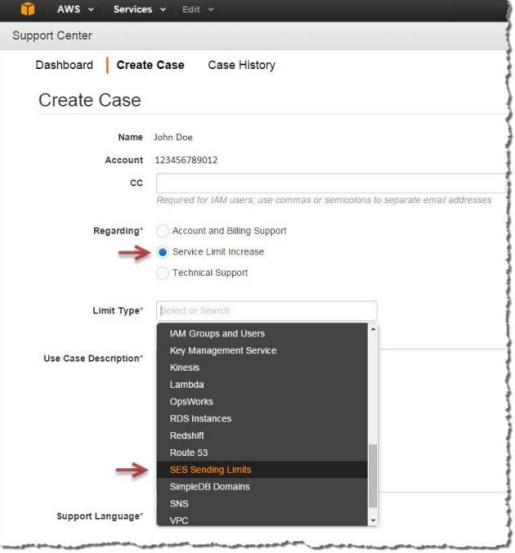 Under “Use Case Description”; you can write your sample uses and how you are going to use Amazon SES. emails through opt-in subscriptions, offline forms and many marketing campaigns. My emails are clean and verified. I have been using other email service provider for long time and now we have planned to make a shift to Amazon SES. I will be using online emailing application which is available here: https://app.easysendy.com. This application can handle bounce, complaint and unsubscription effectively. And, these has been added to my verified email address in my Amazon SES account. 18. Select your Support Language. 19. Select “Contact Method” as “Web”. 20. Finally, click on “Submit” button to send the application form. Once, the form has been submitted successfully, you will receive an email confirmation. And, most of the time approval can take upto 24 hours. You will receive email after approval. After successful approval, you can start sending email campaigns from EasySendy Drip (or EasySendy Pro) application.